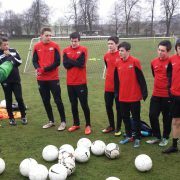 TB visited the headquarters of AMsportstours in Scotland having some training sessions with the U-16, U-14, U-12 and U-10 teams. The training focused on the technical work and individual tactics. The exchange of training methods were very productive for both sports companies.